THE PROCESS OF redistricting means dividing anew into districts or, in particular, to revise the legislative districts of a certain area, typically of a city or state. In the UNITED STATES, the process of redistricting is also referred to as “legislative reapportionment,” which the U.S. Constitution requires so that Congressional representatives are elected according to population. The process of redistricting redraws the legislative district boundaries to reflect population changes and is usually undertaken every 10 years, when the results of the decennial census have been calculated. Redistricting reapportions the population of a state’s Congressional, state representative, senatorial, and other legislative districts, ostensibly to ensure the existence of an appropriate number of districts of approximately equal inhabitants. Although state legislatures are not required to abide by federal constitutional statutes, they are obligated to apportion according to population, geographic size, special interests, and territorial divisions like counties and towns. The legislature is responsible for appropriately redrawing district lines in order to conduct elections for representatives to Congress. Unfortunately, like-minded politicians often create districts that give disproportionate power to small, partisan, unrepresentative minority groups, who sometimes abuse their control. The process of corrupt redistricting is known as gerrymandering, a word whose source lies in the shape that tendentious redistricting often takes: that of a salamander, with extensions into population areas resembling on a map the legs and tail of a salamander. Historically, some states legislatures avoided redistricting, despite population shifts, for almost 60 years. It was not until 1962 that the U.S. Supreme Court, in Baker v. Carr, ruled that a voter could challenge redistricting if it seemed to violate the equal protection clause of the Fourteenth Amendment to the Constitution. 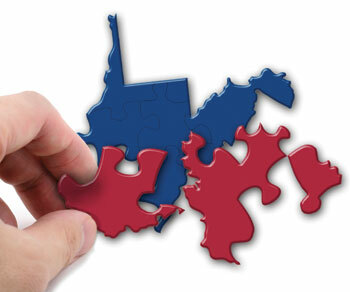 Within a year, lawsuits calling for redistricting had been filed in at least 34 states. In 1964, in Reynolds v. Sims, the Supreme Court determined that population, according to the one-person, one-vote rule, must be the foremost consideration in all redistricting plans for both upper and lower houses of state legislatures. More recently, in TEXAS, redistricting caused considerable friction between Republicans—who controlled the redistricting process—and Democrats and minorities. In addition to carrying out the redistricting mandated after the 2000 census, Texas legislators, led by U.S. Congressional majority leader Tom Delay, decided to redistrict the state again in 2003, to create a more “Republican-friendly” Congressional map of the state. While many Democrats held that the new redistricting plan violated the Voting Rights Act, three federal judges upheld the process. Democrats said they intended to appeal the ruling to the U.S. Supreme Court. In the new plan, the number of Republicans representing Texas in Congress increased. Republicans maintained that the new districts better reflect a growing trend of Republican voters, while Democrats hold that it is intended to weaken minority-voting strength in key districts. The Fort Worth district, for example, stretches from that city to the OKLAHOMA border to include a majority of wealthy white voters who counterbalance the population of African Americans in the inner city area, who traditionally held voting sway in the district. Republicans hoped the redistricting would increase their party’s Congressional representation from western Texas and result in the election of a member of Congress who would support oil and gas rather than farming interests. A similar situation obtained in Austin, in which the city was divided into three districts that extend far into distant, rural ranching areas. For example, the city’s southern portion was gerrymandered into a district that extended 300 miles south, to the Mexican border. While Republicans claim such new redistricting will better represent rural south Texans, Democrats object that the new districts will leave Austin—the capital and most liberal-minded city in Texas—without representation in Congress. As a result of the 2003 redistricting, Republicans said in 2004 that they hoped to win at least 22 of the 32 seats Texas holds in Congress, seats divided evenly between the two parties before the redistricting. While the Texas case is only one example, it is clear that the redistricting process can be distorted to support a majority party’s continued strength, or to deny Congressional representation to certain minorities. Originally thought by founding fathers, such as Thomas Jefferson, to be a process that would ensure continued fair representation and substantial turnover among members of the House of Representatives, the redistricting process has turned out to be the single most effective method for political parties, once in power, to solidify their control of the political process that will determine how a particular seat in Congress is filled. As a result, the House of Representatives has become the more stolid and unchanging house of Congress, where initial election can mean lifetime membership, ensured via the redistricting process.